Let’s get me out of this skirt! The final episode of the second season of Mad Men aired last Sunday. I would be counting the days until the third season started, but I don’t know when that will be; I only know that it’s Too Long To Wait. This must be how Dan feels about Battlestar Galactica. In the ‘Knight’s Dream’ there is a simple beauty in the pose and grouping of the figures. You can hardly fancy three figures better arranged for the purpose of the subject. There is something inevitable about them, which is the highest praise due to a mastery of design in the art of composition. 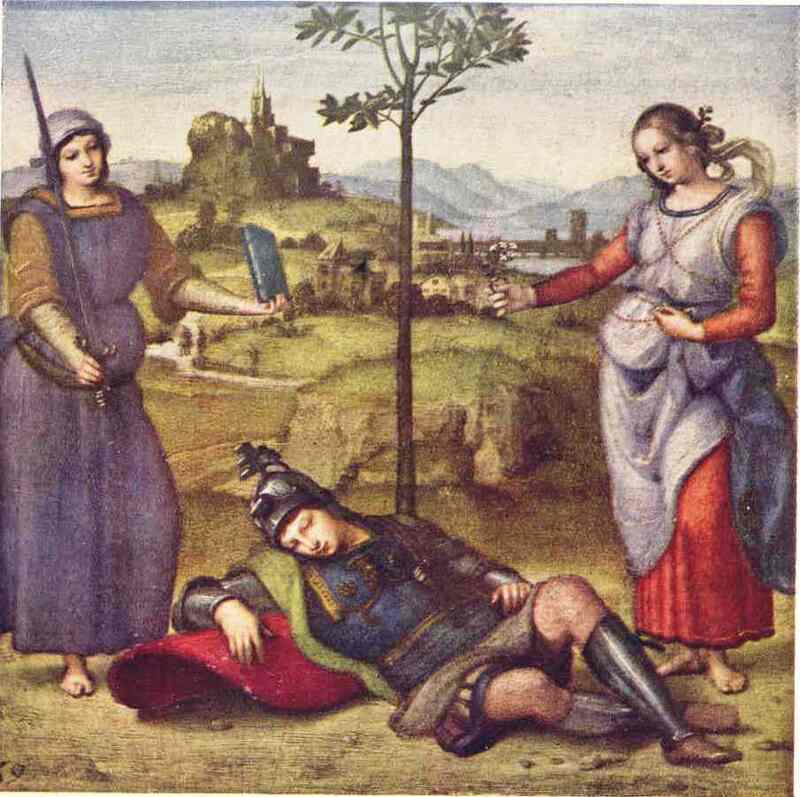 Raphael’s surpassing gift was in fitting beautiful figures into any given space, so that it seems as though the space had been made to fit the figures, instead of the figures to fit the space. Come back next Monday for chapter 7! Rick from lustronconnection.org contacted me tonight to ask if he could post our wonderful series of Lustron construction photos on his site. So cool! 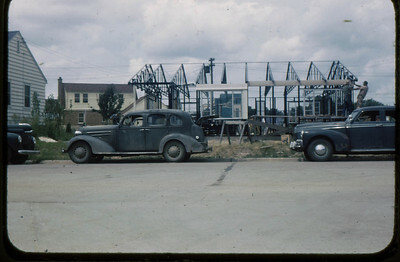 “Our” Lustron is third down on this page (or if it’s not third down anymore, look for the caption that says “Davenport, Iowa, Shortly After Construction in 1949″) and from there you can follow the link to the whole series of color photos showing the construction of my grandparents’ Lustron in 1949. Rick even added some helpful explanatory captions. I guess color photos of a Lustron being constructed are probably pretty rare. I can only imagine the excitement of a Lustron enthusiast on seeing them for the first time :) I’m glad Grandpa’s photos are so treasured! 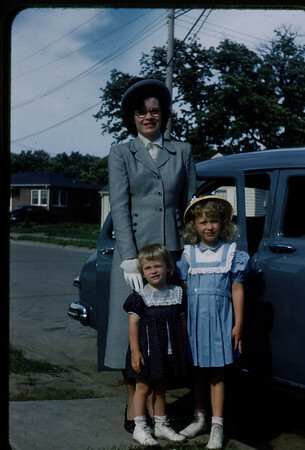 I’ll leave you with a photo of some of the occupants of The Lustron posing next to their new Kaiser Special 4-door in 1950: my grandma, Jean Jacobs; my mom, Sally; and little Susan. Tonight Chloe and I started scanning slides and uploading them to our new family photo album at http://dubsol.smugmug.com. 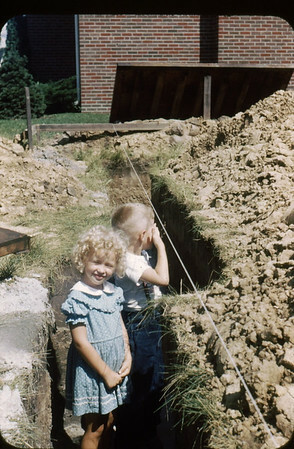 We did 50 slides from 1949 and 1950. 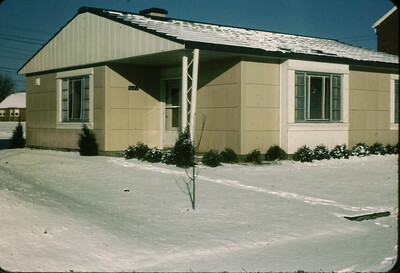 We made an entire gallery of photos of the construction of The Lustron, the pre-fab metal house that my grandparents built in 1949. Amazing! The manner in which this picture is painted is still more suggestive of change than the subject itself. Our artist knew a great deal about the new science of perspective, for instance. 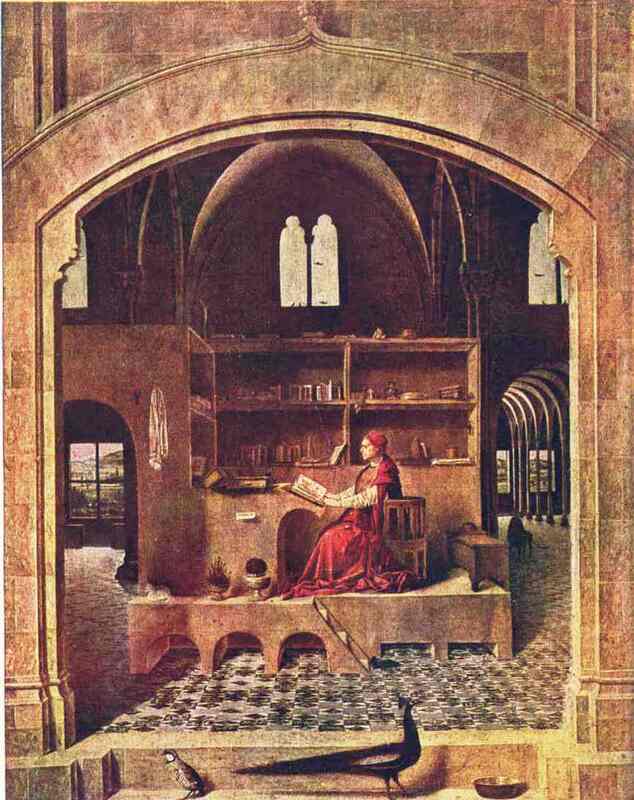 One might almost think that, pleased with his new knowledge, he had multiplied the number of objects on the shelves so as to show how well he could foreshorten them. Medieval painters had not troubled about perspective, and were more concerned, as we have seen, to make a pretty pattern of shapes and colours for their pictures. The Van Eycks, as we noted, only acquired the beginnings of an understanding of it, and were very proud of their new knowledge. It was in Italy that all the rules were at last brought to light. Come back next Monday for chapter 6! Thank you, everyone, for your sympathy for Henry and his sore throat. He’s a little better today, and felt well enough to play World of Warcraft and eat a quesadilla. Dan and I took a nice brisk walk this evening, and he brought his camera and managed to get a few good pictures of me! Poor Henry woke up with a bad sore throat :( Poor, poor Henry! We’ve been watching the behind-the-scenes appendices from The Two Towers all day. Because the edging instructions for my Leftover Laceweight Scarf pattern confuse just about everyone, I knit a sample scarf end, worked the edging, took lots of photos and made lots of notes, then re-wrote the edging instructions in my pattern. I hope it helps! 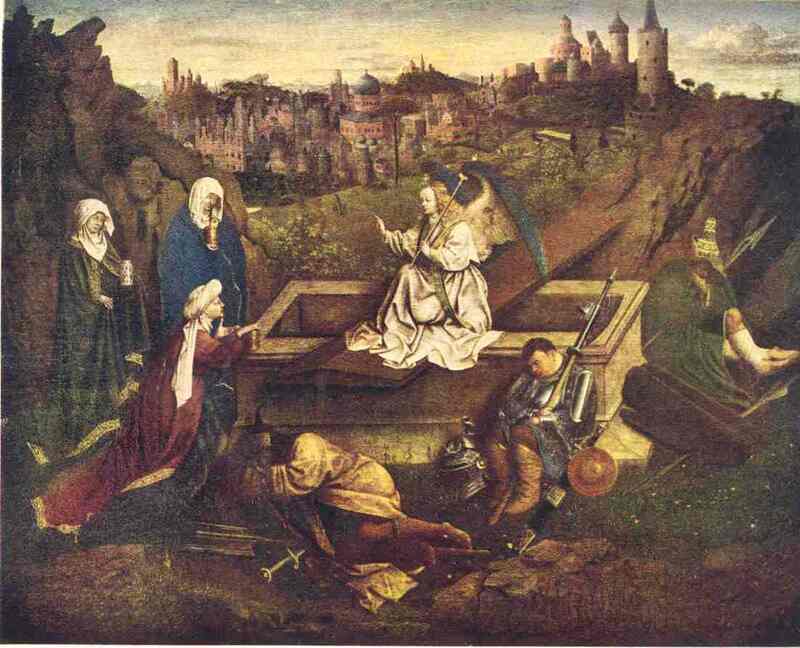 Hubert van Eyck, in attempting to depict the event at the Sepulchre as it might actually have occurred outside the walls of the City of Jerusalem, was doing something quite novel in his day. His picture might almost be called a Bible illustration. It is at least painted in the same practical spirit as that of a man painting an illustration for any other book. It is not a picture meant to help one to pray, or meditate. It does not express any religious idea. 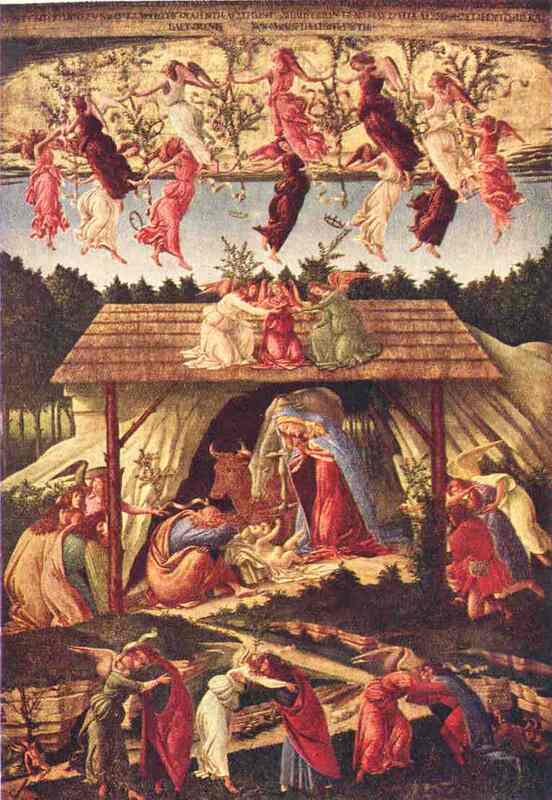 It was intended to be the veracious representation of an actual event, shown as, and when, and how it happened, true to the facts so far as Hubert knew them. Come back next Monday for chapter 5! We’re having crazy October weather. Last week we had a heat wave and it got up to 98 degrees Fahrenheit in our neighborhood (that’s 36.6 Celsius), plus the typical hot dry Santa Ana winds blowing in from the desert. Now we’re having a cold snap — it was 46F (7.7C) outside today when I woke up at 8am, and 66F (18.8C) in the house. The heater even turned on last night for the first time since last winter! We all hope it stays cold. I love bundling up in my warm woolly clothes and not needing an ice pack to keep my feet cool at night. But since it’s October in San Diego, it’ll probably be 100 degrees next week again. I’m having mouse problems with my Macbook. Something in the button has broken and it randomly decides that I’m clicking it even when I’m not. It’s more manageable if I never click the button at all, so I’ve got my external mouse hooked up all the time, but I still get the occasional random button click, which can have hilarious or disastrous results! I have to try to remember to park the cursor over a blank area of the screen, not over a “submit” button. Dan can install a new mouse assembly for me (wonderful Dan! ), but that means buying one, which is annoying. I got about 5st/inch and about 6.5 rows/inch, so I cast on for the XS size but am working the neck increases every four rows. And I’m working a few sets of short rows across the back. Stopped increasing at 162 st (including the 4 CO st under each arm), worked a couple rows, then dec away 2 st from the back under each arm (158 st total). After working the welt, I increased to 200 stitches for the peplum. I worked the lace pattern 6 times and then worked the hem, splitting the yarn down to 2 plies for the underside of the hem and sewing down the live loops instead of binding off. Working sleeves flat and simultaneously on one long circular needle with two balls of yarn. A bit awkward but by god they’ll match. Decreased sleeves down to 54 st over the first 12 rows or so, now will work plain for a while. Ok 126 rows seemed long enough for the sleeves. Then I worked the YO turning row and then the facing with two plies of yarn. I worked two sets of short rows across the back neck edging, first set at back raglan and second set 6 st back from there. Worked three garter ridges, then cast off on the next RS row, giving the effect of four garter ridges. Thank you, LibriVox volunteers! You’re the best! Our first picture is a portrait of Richard II. on his coronation day in the year 1377, when he was ten years old. It is the earliest one selected, and the eyes of those who see it for the first time will surely look surprised. 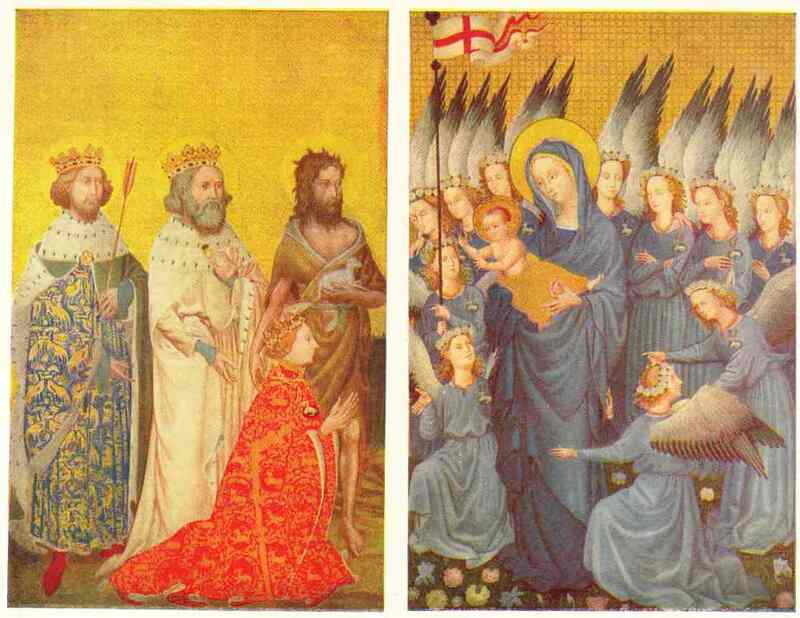 The jewel-like effect of the sapphire-winged angels and coral-robed Richard against the golden background is not at all what we are accustomed to see. Nowadays it may take some time and a little patience before we can cast ourselves back to the year 1377 and look at the picture with the eyes of the person who painted it. Let us begin with a search for his purpose and meaning at least. Come back next Monday for chapter 4! I love this “Banned Books” display! Read a banned book! How about Huckleberry Finn? In other news, it was 96 degrees Fahrenheit here today. Good lord. Henry and I sat around and melted all day. I fixed milkshakes for lunch — chocolate ice cream, rice milk, a couple spoonfuls of peanut butter. Yum.